Sometimes it is funny to think about how different people spend their time. In this instance, an artist designed the home of Bilbo Baggins, from “The Hobbit” out of 2600 balloons. 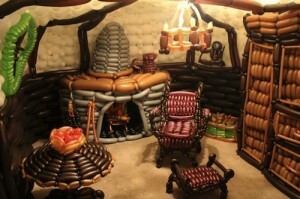 Jeremy Telford, the artist, lives in Utah, in what we suspect is a house NOT made of balloons. It does show that a space can be built out of even the oddest materials, although we would be careful if we had any sharp objects in my pockets when sitting down. It is sort of amazing that he built it in only 40 hours and you can see a video of the process here, on this website that is aptly named, Oddity Central.